Gold Coins, Gold Bars and Gold Ingots – What Is the Difference? If you are going to invest in gold bullion, it is important that you realize all of your options, and the different physical gold investment forms that you can buy and sell. Gold ingots, bars, and coins are the three main types that you will find on the market, and this is true of most precious metals. But what is the difference between these forms? Gold investing means knowing these facts so you can choose the type which works best for your investment goals. Gold coins can be found in two different types, those valued for the bullion amount or those with historical value which are often rare, called numismatic coins. The numismatic coins may often have a value greater than that of the precious metals these coins contain, while the bullion coins are valued solely on the precious metal they contain and demand for this metal. Some investors prefer bullion coins due to their small size and ease of transportability, storage and concealment. Some bullion products may carry a significantly higher dealer mark up only due their popularity and higher investor interest. Numismatic coins, on the other hand, are not good for investment due to all the extra costs embedded into their price like rarity, grade, demand and so on. In layman’s terms, bullion is for investors, rare coins are for numismatists. Gold ingots may also be referred to as bars, but they are formed differently than the minted bars which are so popular. 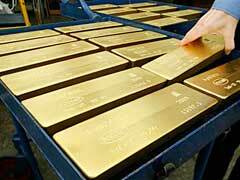 With ingots the weight contained can vary, and these bars are poured instead of stamped. This causes them to be thicker than the stamped bars usually. When you buy gold bullion bars you will normally get the stamped version, while purchasing gold ingots means you will get bars which were pored into a cast instead. When you are deciding between various options of your preferences, finances will play a big part in your final decision. If you want gold that you can easily store and look at then coins may be ideal. If you want larger sizes, so that you pay lower premiums and make a better investment, then gold ingots and bars may be a better choice. The only thing to remember is to always see in the future and where the value of your investment might be. When selling, coins are easy to sell due to their global popularity and recognition, bars (especially larger varieties) may require additional assaying expenses, while ingots might be a wild play in the end.